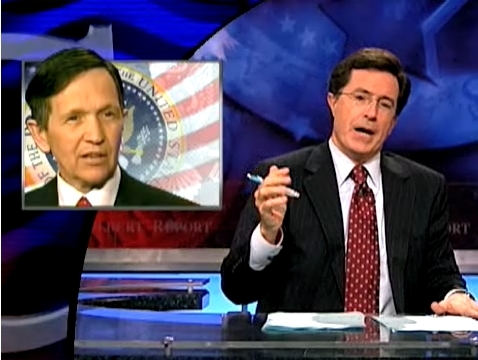 Having endured Stephen Colbert's barrage of televised insults and barbs, not to mention a suspicious inquest into the contents of his pockets, Congressman and "vegan wood spirit" Dennis Kucinich will personally (and, perhaps, magically) appear on "The Colbert Report," Stephen says ... to empty his pockets. Go Dennis. The smartest guy in the presidential race talking with the funniest guy on TV.